Ed King is a modern-day American re-telling of Sophocles' Oedipus Rex, in which the abandoned child of a 15-year-old English au pair is secretly adopted and brought up to be a high-achieving golden boy. This foundling builds his own billion-dollar IT company, only to discover that his parents were not who he thought they were and worse, neither is his wife. It's clever, sharp and often funny, and yet there just seems to be something missing. That something could, I suppose, be suspense - after all, the two things everyone knows about Oedipus is that he inadvertently killed his father and slept with his mother, so the experience of reading Ed King is largely a matter of waiting patiently to see how Guterson will arrange for Ed to do these things, rather than being shocked when he does. Or perhaps what's missing is any real degree of sympathy with the protagonist. Ed is neither interesting nor likeable: he's a spoilt narcissist who seems to breeze through life with only one small glitch when he's briefly depressed about killing someone, and is inexplicably irresistible to women of all ages from the age of about 12 upwards. Consequently, after endless plodding pages about his brattish teenage behaviour and tedious college years, full of hubris and a sense of entitlement, I found it remarkably hard to care about his fate. Admittedly, the supporting characters are more engaging. Walter, Ed's father, is a sad, inadequate little man who pays a troubled English teenager to look after his children, and although there's little about Walter to like, his deeply creepy attraction to Diane, sense of inadequacy and nagging dissatisfaction with his lot makes him interesting, at least. Diane herself is complex, clever and resourceful, albeit far from scrupulous. However, I found her relationship with her deadbeat half-brother deeply unconvincing, and hard as he tries, Guterson simply can't write colloquial British dialogue with any degree of authenticity. There were times when I winced. It's as if the author did lots of research and made lots of notes from English films and books, and then tried to include everything he'd learnt, meaning that a lot of the scenes with Diane and her brother, or even just from Diane's point of view, seem awkward and forced to an English reader. The way Guterson has updated the Oedipus myth to subvert the American Dream is undeniably clever. Mythical Oracles are replaced with mysterious tarot readers and King's company's own super-advanced search engines. Pythia is King's company; the Greek chorus that frames the narrative takes the form of online forum users. It's all very skilfully done and often witty, and a large part of my enjoyment of this book came from spotting the allusions and parallels - even when they're painted with a pretty broad brush. Unfortunately, however, overall the book is often quite simply rather dull. The nature of the story means that there are many chapters which just feel like endless plodding exposition in the build-up to 'and now he realises he's married to his mum', which of course, we all know is coming anyway. 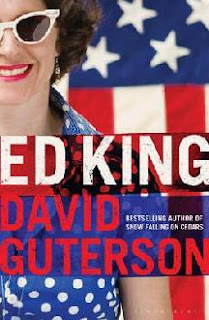 If Guterson had just made it all a bit less obvious, a bit less clunky, not so slavishly devoted to Sophocles' plot, I'd have enjoyed Ed King a great deal more.